When it comes to the sports media industry, few people can offer better insight than ESPN’s Jorge Sedano. 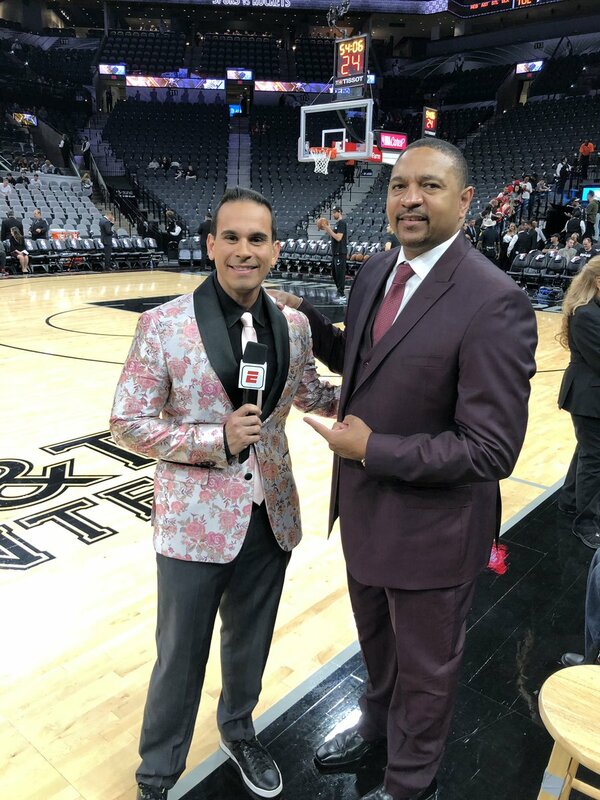 With prominent radio and television experience, Sedano has covered sports nationally and locally on both coasts. Last September, Jorge moved to his current time-slot, hosting afternoon drive on ESPN Los Angeles where he’s innovatively building a radio show. Whether he’s implementing new concepts or eyeing his next career move, Sedano has never shied away from taking a risk. As he’s in the process of growing his radio show and audience, Sedano has looked around the industry for ideas. Professionals getting together to share those ideas offer a unique opportunity for sports radio to improve. Sedano is a proponent of teaching and learning from others as a way for the industry to evolve. With this year’s BSM Summit quickly approaching, the ESPN Los Angeles host took time to discuss the sports radio format. Brandon Contes: You’ve had success with morning, midday and afternoon shows. For you, how different did you find doing a morning drive show versus afternoon drive? Jorge Sedano: First of all, just simply from a press perspective, the advantage of doing afternoons is you have everything that happened the night before, plus everything that developed during the day. It allows you to be more selective and potentially go deeper into certain conversations, whereas with the morning, you’re focused on what happened the night before. If stuff develops, while you’re on the air, you’re going on the fly. A lot more happens on the fly when you’re doing mornings and you can’t really go into as many of the deeper conversations because people’s listening habits are also different. I’ve seen this research over the years, that in the morning, people have more interest in skipping around to different radio stations and different formats. There’s a lot of different stops in the morning, people are going out, they’re dropping off their kids, they’re getting their coffee and getting gas, they’re in and out of the car more as opposed to their commute home where, let’s face it, you just want to get home. You have to stay a little more on the surface in the morning and they say ‘play the hits,’ you have to play the hits regardless of the time slot, but especially with morning drive radio. You really try to stay on the surface with content, give people the meat and potatoes and maybe you’re skipping dessert. That doesn’t mean you can’t have dessert occasionally, or you’re not sneaking content in that isn’t mainstream, because you do want to be able to mix in personality and have fun. But in the morning, when you have a more limited opportunity to grab people, you have to come out firing with the hits. BC: Do you have a preference, hosting mornings or afternoons? JS: Oh man, definitely afternoons. First of all, you have a lot more time to breathe and really focus in on some of the content you want to discuss, and like I said, you can go deeper in the afternoon because let’s face it, especially now with technology, people are up to speed pretty quickly. They may not be up to speed in the morning because everyone’s rushing out the door, but by time they get to you at 3 in the afternoon, they’ve been reading, listening and watching on TV. They’ve caught up to a lot of the news, so you can be more nuanced in the afternoon. The other part of it is, I specifically find myself to be someone who is more engaging in the afternoon. By nature, I’m loud. I get very passionate and animated and I think that plays better for me in the afternoon. And then there’s the wake-up! Morning drive is really hard on your body, mentally as well. It’s a grind. When I lived on the East Coast working in Bristol filling in for Greeny on Mike and Mike, there were a number of times I’d have to stay up, watch the game and then just deal with sleep whenever I was done with the show. One of the last Mike and Mikes I hosted was the night the Warriors were going for 73 wins and Kobe Bryant’s last game of his career and I’m sitting there in a hotel in Bristol, watching both games, flipping back and forth between ESPN and ESPN2. I went to bed after watching the coverage and it was such an emotional fun night, I probably went to bed 1:30 or 2 o’clock in the morning on the East Coast and I had a 4 o’clock wake-up call – so I may have slept two hours that day, but that’s the sacrifice you make when you’re doing mornings. It was a little easier to do it on the West Coast, obviously, because things start earlier out here. But at the end of the day, that 4am wake up is not fun (Laughs). I prefer to be someone who gets to stay up to watch everything, go to bed at 11 o’clock and wake up like a normal human being somewhere between 6 and 8am. BC: What was it like going across country from Miami to now Los Angeles? How do those markets compare? JS: It’s interesting, there are some similarities; the marketplace has similar demographics. Half the town is Hispanic, and I think that plays into the way radio is rated in both cities because of the 50% that’s Hispanic, there’s a large chunk that aren’t English-dominant. So when it comes to ratings, the marketplace is frayed more than most markets. Having that experience in my back pocket helps me understand the landscape. Both towns get a bad reputation for being bandwagon fans, but I find the fan that goes to games and listens to sports talk radio is as passionate as any city I’ve been in. When you live in cities like Los Angeles or Miami where demographics play a factor, not everyone’s into American sports, or at least they’re not all into the sports that we talk about on sports talk radio. With Hispanic people, soccer plays a very big role in the community. In Miami, the Cuban community is not into soccer, but in Miami you have a big South American contingent, much like in Los Angeles you have a large Mexican Central American contingent. Soccer is a dominant sport in those cultures, boxing is big in those cultures, baseball to a certain extent, but outside of baseball, those other sports don’t get a lot of play on sports talk radio. Then there’s the ability in both cities, where you have sunshine 300 days of the year, people aren’t always as interested in going to watch a bad product. If the teams are not performing, I can see where it’s like – I’d rather go to the beach and I get it, but I think fans in L.A. and Miami get a bad rap. Los Angeles is obviously much bigger; it’s a much larger area, there are fans of a lot of different teams because there are so many different teams here. Whereas in Miami, maybe the college fans are spread out amongst Miami, or Florida or Florida State, etcetera, but predominantly everybody is a Dolphins fan, everyone is a Heat fan. Baseball might be a little different because baseball was born in the ’90s there. Here in LA, you could have Dodger fans or Angel fans. There’s plenty of Laker fans, a small pocket of Clipper fans, you have the Rams and the Chargers and there are plenty of other fans here when it comes to the NFL. But the fact is, fans can be frayed from all the different teams here. BC: Did hosting nationally help you learn how to sort through all the potential topics in L.A. and know what to focus on? If you come from an area that has just one team and you’re talking Packers everyday and then go to Los Angeles where there’s a dozen different teams to talk about, it might be hard to figure out what to focus on. JS: I would say it was the reverse, having lived in Miami, which is transient, meaning I could talk Miami, but also talk New York, that helped me when I got my first national gig at Fox Sports radio in 2004. But once you get to the national level, you’re playing the hits because your audience is so much larger. When I was doing national overnight in my mid-20s on Fox sports radio, I was on 300 radio stations and in some of the biggest markets on some of the biggest stations in America. I was on WEEI, I was on in L.A., I was on basically everywhere outside of New York. I think you just base it on whatever the big national stories are. During certain times of the year, you would talk mainly NFL and then you shift based on the sports calendar. But I do think it certainly helped some. I’ve had a number of different great opportunities throughout my career, I’ve learned from all of it and it got me to this point where I feel like I’m doing the best radio that I’ve ever done, even though I am doing something a little different now with the Los Angeles show as opposed to the shows I’ve done previously, which to me makes it more interesting, because I’m challenging myself in the way I’m going about this LA show. BC: Can you expand on what you’re doing differently a bit? JS: Over the years, I’ve done different shows; I’ve done the solo show and the partnered show, but with the L.A. show, I’m trying to combine a lot of things. For example, it’s my show, there are times I will go solo, sometimes I’ll do only a couple of hours or even just one hour solo – but the constant is – I always want people in and out of the studio. Generally, 80-90% of the days I have a guest co-host of my choosing. Someone I’m friends with, who I respect and I know I’m going to have a good time with while we’re in the studio. Then we’ll rotate guests that will flow within the construct of the show. The advantage of being here in L.A. and ESPN having an office here in L.A., makes that a lot easier to get those guests into the studio. I’ve pulled from a few philosophies, from a radio perspective. The guest co-host thing – Le Batard has done the best of that over the years and then you look at Colin Cowherd who has Joy Taylor there as his co-host, but then he also has guests in and out of the studio regularly. I’ve married those two theories and the reason I’ve done that is because if you look at the way people are consuming audio now, it’s changed. Over the last three or four years specifically, podcast listening has grown exponentially and it’s only going to keep growing. Because podcasts have become so popular, I’ve created this feeling of constant change within the construct of the show, people swooping in and out, different opinions, resetting with different people, getting their thoughts on some of the conversations I may have had earlier. I’m bringing that podcast feel to terrestrial radio, while taking elements from two guys that I respect immensely and it’s worked. We’ve been on for four months and every month the numbers are getting better. The audience is growing, the podcast numbers are growing, the digital impressions are growing. I think I’m in a unique position because I do so many things with the company, on television and now in radio, that I can have all these people on the show because I’ve created real relationships with people in different facets of ESPN and even outside the company. BC: That’s very interesting, do you see that as the future of sports radio and could potentially translate to other hosts and markets, or is it unique to you? JS: I think it’s somewhat unique to me for a number of reasons. First, I’m in L.A. and we have an office in here with people constantly running in and out of because of the television shows that we produce there. The fact that I’m on these television shows like The Jump, which I’m so thankful to Rachel Nichols for allowing me to be part of that family, it helped me foster even better relationships than I had previously with people that are in the NBA circles. The fact that I’m on NBA games and I do sidelines allows me to create relationships with people and have them come on my show. The concept of the best radio shows, to me, are the ones where you can tell the people generally like each other. If you go back to Tony Kornheiser’s old radio show, he always had his friends on. Le Batard does that too and that’s something that I’ve now done to an extent. I try to have people on the show because we have a relationship outside of the workplace and we’re actually friends. It gives the listeners an intimate and honest conversation each day and I think that makes for better radio. As I’ve gotten older, I’ve gotten less of an ego, so it doesn’t have to be me being a gas bag for four hours and just ranting and raving about my own opinion. Let’s bring fun, smart people in here to enhance the conversation and let them challenge me on what I’m saying, or let’s laugh about something that’s going on in the world of sports and let’s present it in a unique way. You can do that in a big market. In smaller markets, it may be tougher, but I don’t think it’s impossible to duplicate. It’s about the host wanting to create and carve out these relationships with the people that matter in their communities. This business is all about relationships and I’ve learned that it’s about what’s coming through the speakers, it’s not about me anymore. One of my strengths is I bring the best out of people because I ask the right questions and I’m willing to challenge people and not everyone likes that, but I think it makes for interesting radio as long as it’s always done in a respectful way. Could it be duplicated in other markets? Yea, but I don’t think it could be duplicated everywhere. Less so about me, but more about the availability of the people that would need to surround the show. But so many hosts are out prove to people that they’re the smartest person in the room and I think sometimes it’s best to just to have real conversations and have fun with it. BC: What makes radio great is the intimate connection between hosts and listeners, but when shows are new, it takes time to develop chemistry and warm up to the audience. Bringing in different hosts on a regular basis is something that a lot of people would shy away from because it takes time to develop a connection with listeners. Since you pick your friends and people that you’re comfortable with and you’re able to have unique conversations, does that help the new co-host to connect with the audience? I weave those conversations into an individual segment and I think that’s how I’ve been able to connect to the audience a lot quicker – because I’m putting these conversations out there. But I think you have to still be disciplined when you do that. Where radio shows get in trouble is when they have this conversation for 20 straight minutes without any sports content. You have to be disciplined in saying – okay this will only be a conversation that’s going to last no more than three, four, five minutes tops, and then the second half of this segment I’m going to get to sports and I’m going to remind people that we’re getting back to sports. People have short attention spans. There’s too much technology, too much stimuli out there too many options. Whatever conversations you’re having, you want to weave in your personality to allow your co-host to show their personality and that way you can endear yourself to the audience. It’s not an easy dance. BC: I think it’s a cool approach and a good way to do something different. Does it keep it fun and exciting for you because you’re constantly having different conversations and interacting with different personalities? JS: Absolutely! The show on before me, Mason and Ireland, I do a cross-talk segment with them every day and they’ll ask me who’s co-hosting today and recently they asked if I like doing it this way. Look, I have a monogamous relationship with my wife. On radio, I don’t want to be monogamous, I want different people on. Variety is the spice of life and I fulfill that with my radio show. BC: Do you enjoy the cross-talk segments? They’re becoming more popular on different stations around the country. JS: Definitely. Those guys are a blast. They’re legends in Los Angeles. They’ve been doing middays forever and I think they’re the best midday show in America. They’re so different, yet so much the same. With cross-talk, I throw in a different vibe of someone who likes to mix it up with them, but also likes to laugh. For example, not to say John Ireland doesn’t like to laugh, but John is more the sports guy and Mason is a sports guy too, but Mason likes to laugh. For me, it’s a great balance of trying to make Mason laugh, while John gets a kick out of it and then John brings it back to the center and talks sports. It’s a fun dance to be in there with those guys and three people in a room, especially three big personalities, isn’t easy to juggle, but we make it work and most months it’s the highest rated half hour on the station. BC: Are there ever times when you don’t want to do the cross-talk? After the Saints and Rams championship game, a polarizing finish, I’m sure you have plenty of opinions on it and Mason and Ireland were just talking about it for three-hours. Would you rather just start the show by yourself and say what you need to? JS: I still enjoy the cross-talk with them because once my actual show starts, I get to open it how I want. I’ve done it before where I take the first segment to do what I feel I need to and then I’ll bring in the guest co-host after. I have that flexibility. I’ve trained the audience in a way where, slowly but surely, they get it. The first month or two were tough because they didn’t get it, they didn’t know what was happening, but now they’ve embraced it and understand the rotation of people. We try our best to rotate the same group of people as frequently as possible. The station has done a great job of promoting the show as being a completely different style of show than anything else they’ve ever had on-air. The station’s support has helped and the audience keeps growing. We’ve seen it not only in Nielsen numbers, which while no ratings measurement is an exact science, it’s palpable, but I go out in the city and people are talking to me about the show and they want to discuss the guest co-hosts. They’ll gravitate to sports conversations, but they also gravitate to the non-sports conversations. We’ve done events for the show where we just invite the audience to come hang out with me and watch a game and it’s really, really flattering how people have supported the show very quickly. BC: Do you prefer hosting local or national radio? JS: That’s a great question. I think hosting locally is more unique because you get to ingratiate yourself to a community, you can go out to these events and there is a real sense of who’s listening to you. Nationally, there’s almost a barrier, you’re not going out and doing a lot of events outside of the studio, just the occasional a big event like the Super Bowl. BC: Does Radio Row make for good radio? JS: I chose not to go this year – first because Radio Row does nothing for me from 6 to 10 PM Eastern. But secondly, I don’t think the audience wants it. There are too many people hocking stuff, everyone gets the same guest so it’s annoying because you’re seeing the same things being recycled. Could you get a few good minutes of content? Sure, but I think the whole experience is overrated at this point. BC: It’s definitely harder to build that community you were talking about with national shows. When I listen to a new radio show, I almost enjoy not getting all of the jokes at first – I like that they have their own community and it takes time for me to understand everything. I think that shows they have great chemistry with each other and the listeners. JS: Right, and you do want your own inside jokes on a show. Will it turn some people off? Sure, but I think it makes people more inquisitive about the show. Honestly, Le Batard has done it the best of anyone, when it comes to building a community with a national radio show. Outside of Stern, I don’t know if there’s a better person to pull that off. Dan has been able to do that unlike anyone I’ve ever seen. There are some similarities to what Howard built with him and his cast of characters to what Dan has now done with Stugotz, Mike, the Shipping Container and those guys. But, to answer your original question, I would prefer local mostly because of the unique experience of being able to really feel part of a community where that’s just so much harder to make happen on the national level. BC: When you look around the sports radio industry, it’s very white-male dominated, both with talent and management, so how does the industry do a better job of creating more opportunities for Hispanic people, people of color and just get more diverse in general? JS: The biggest problem with sports talk radio – and to be clear this is not only an issue in sports talk radio, but we really have a huge problem with this – they don’t allow young people to develop. They’re afraid of giving a young person an opportunity because radio is so ad and sales driven that you’d rather go get a guy who is the local TV anchor, or a newspaper columnist because he has some name recognition, even though he or she may not be a great talk show host. I’m not trying to single those people out, I’m just using them as examples. It could be anyone in a particular community who has some name recognition, but radio is hard! People don’t realize that. I’ve become good on television because I’m good on radio. I’ve seen people try to do the reverse where they’re good on television and try to do radio and it’s much harder. The ability to speak hours on end on radio for 10 minute segments or longer, allows you the ability to adlib and freelance on television and seem more seamless when you’re having these conversations. If anything, the hard part about doing television after doing radio is you have to be more succinct, but the content and the ability to speak and flow, makes it so much easier. I’ve had this conversation when I lived in Miami and also here in L.A. – we need to do a better job of finding the young Hispanic kids, or young African-American kids who are in these colleges in local communities, who want to be broadcasters. Let them come in and do weekend shows or find the guys who are doing a really good local podcast and put them on the weekend or at night where it’s not a high leverage situation and you’re not worried about ad revenue or things of that nature. Just let it bake a little bit! Traug Keller who runs ESPN radio has a saying, ‘let it bake’, and people don’t do that. They want instant gratification and radio isn’t like that. It takes easily six to nine months for a radio show to gain any real traction and it doesn’t matter who you are. I remember when Le Batard first started doing local radio, he will be the first to tell you it wasn’t good! But you know what? They stuck with it and it’s become arguably the best show on all of radio, let alone sports talk radio. It’s thinking outside the box. People are averse to taking risks in the industry. When I was coming up 20 years ago, there were a lot of guys doing local radio in small markets and they were working their way up, but now a lot of these small markets don’t do as much local, so you don’t have as many guys coming up that way. And then the big stations are more risk averse, so they they’re going to go with the names that people recognize as opposed to giving someone coming out of college a chance. I think it starts there because when you go to colleges, there are going to be people from all different backgrounds and whether they’re white, African-American, Hispanic, Muslim, there will be all sorts of different people and that’s how you become more diverse. But the Hispanic thing to me is fascinating. I get it in a market where there’s not very many Hispanics, but when I was doing local radio in Miami, a city where 50% of its demographics are Hispanic, there were three Hispanic hosts on the air when I was there for a long, long time. It was me, Dan Le Batard and Orlando Alzugary. That’s ridiculous! In L.A. we could do a better job of that as well. And by the way, I’m talking about the spoken word format because I do think FM stations do a nice job of being diverse, particularly on the younger formats. But it starts by going to the local colleges and finding kids that want do this for a living and grooming them, and I bet you there’s plenty of them. We need to do better with people of color in general. BC: It’s great that there are so many platforms and ways to get started in the business with college radio stations and podcasts. There are certainly opportunities for people to have their voices heard and it also creates the opportunity for management to find those people as you pointed out. But are the opportunities for people to climb within the industry there? I’ve compared it to the NFL – there are plenty of people of color that are hired as assistants and scouts, but how many of them actually get the opportunity to advance to head coaching or general manager positions? JS: Yeah, you’ve hit the nail on the head. That’s the unfortunate reality that we live in, but until people are willing to take more risks and by the way, teach! When I was coming up in radio 20 years ago, people taught me! Now you’re expected to step right in and do the job. You have to coach people and that goes for hosts too. I have two producers, both African-American and I’m very proud of that and I look at those guys and I knew them a little bit, but I have to coach them to do things the way that I like and do things the way that allows me to be as successful as possible, and they’ve been great about it. And coaching has nothing to do with the diversity question, but we don’t coach people. Whether it’s management or hosts, we expect people to do the job and expect them to know how we want it done. It’s important to explain to people, ‘Hey, here’s the method behind the madness. Let’s just do it this way. Is that cool with you?’ Most people in this business want to keep growing and they’ll accept coaching because they know that the product will be better for it. BC: Is there a specific person you could call out that helped teach you along the way? JS: Yea, it’s definitely a variety of people. I’ve been in contact with so many great people over the years, I could go through a million who have helped me. The first person who hired me was Manny Munoz and he works at a news/talk station in Miami, WIOD, but he was the person that taught me what it was like to work hard when I didn’t know anything. I did everything; I ran a board, updates, I hosted and all of that is important and having someone there to show you the ropes is important. Throughout the years, so many different people at ESPN helped me grow and I like to pass that along and help others. One of my proudest moments is the fact that a lot of the guys that I’ve worked with that produced my shows have gone on to bigger things. The guy who produced my last iteration of my Miami shows, Andy King, he’s a Director of Sports Programming at Sirius now. What are the people you’ve worked with doing? How have you helped them get better? To me, that’s as big of a legacy as anything. I don’t recall anyone ever reaching out to me or pulling me aside to chat for a couple of minutes and I wasn’t able to give them my time. I had so many people that helped me along the way so I make it a point that if a kid reaches out to me via email or at an event and asks me questions, I absolutely go out of my way to talk to them for as long as time allows me to. I don’t have a magic elixir or formula as to how it’s going work for everybody. Everybody’s situation is unique and different, but I always feel like you need to pay it forward. BC: I know you’re unable to attend because of an ESPN assignment, but how important is it for programmers and people in the sports radio to attend conferences like the upcoming BSM Summit? JS: It’s important for the programmers to get together, to listen to talent, to be able to interact with some of the younger talent and see how their line of thinking has evolved and it allows programmers to evolve too. It also allows the talent the opportunity to explain to people how it is that they do their work, which then allows people to see there are different methods to the madness. The way I prepare for and execute a show is different than the way Colin Cowherd or Dan Le Batard does. It allows people to share their own ideas on how they decide to go about it and how they see the business moving forward, both from a content perspective and a business perspective. Sharing ideas is always a good thing and we should be doing more of it. BC: We obviously hit on a couple of important issues in sports radio, but what do you hope gets addressed at the BSM Summit? JS: I think the two things that need to be addressed are diversity and the coaching of talent, producers and everyone under the employ of a programmer. Local radio stations need to reflect the community. If the community is diverse, then the station needs to reflect that diversity because it will only help your radio station build a stronger community of listeners. It will grow from a listenership perspective, the audience will grow, the ratings will grow, the revenue will grow and all of that matters. And if we don’t reflect the community, then I think you’re really missing out on the big picture. You’re there to service a community, and if you’re going to do it, you should do it right.